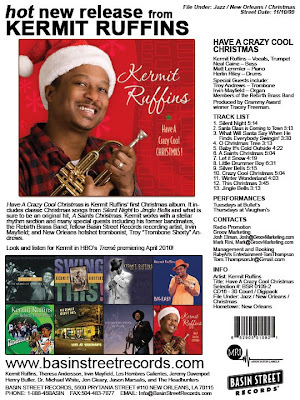 Kermit Ruffins‘ first Christmas album, Have A Crazy Cool Christmas. Coming November 10, 2009. Ho Ho Heaux. Email bulkpricing@basinstreetrecords.com for info on bulk pricing. We will celebrate the release at the Blue Nile in New Orleans on Friday, November 27th. See you there!